Ward Office: meet Susan Ong! 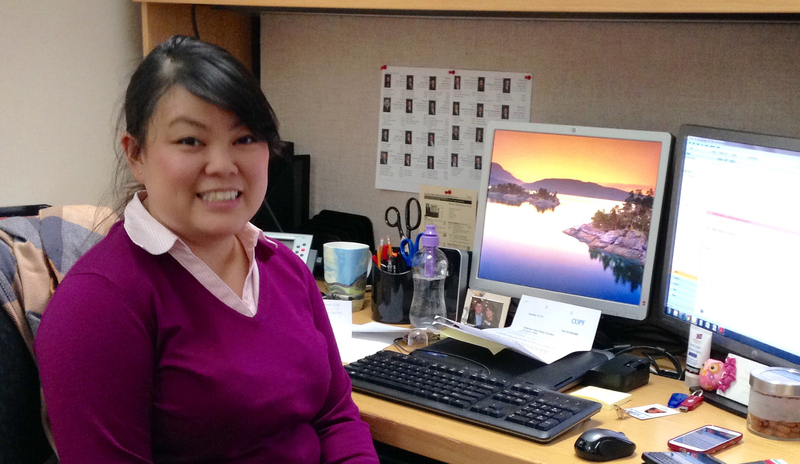 Home / Ward Office: meet Susan Ong! In the first few weeks, I’ve been known as the snow, sidewalk, parking and tree girl. But in the new year I’ll also be working on all matters relating to Jeff’s work at City Hall other than Planning Committee matters. So I'll deal with Jeff's other Committee work on Environment, Transit, IT, Film and TV, and Crime Prevention Ottawa. Most recently, I was an immigration and policy officer for the Australian Government, and spent a time working as Departmental Liaison Officer in the office of the federal Minister for Multicultural Affairs at Parliament House in Canberra. I have been very fortunate to have had some really amazing experiences – I worked on the immigration service counters in Sydney, as a policy officer in Indigenous Affairs and was fortunate to meet with Indigenous people in Alice Springs. And I worked on Christmas Island in a variety of roles throughout the immigration detention centre and processed newly arrived asylum seekers. I'm Australian, so you might hear an Australian accent when you call the office! I am very fortunate to live in Hintonburg and be surrounded by so many great food establishments like Sam’s Cafe at Fairmont Confectionary, Bread By Us, Hintonburg Market and Holland’s Cake & Shake. However, my absolute favourite place and group in Kitchissippi is the Parkdale Food Centre. I love spending time volunteering here as there are so many amazing people and volunteers, and I love cooking. The commitment of the Parkdale Food Centre to addressing the systemic issues around food and teaching life skills – not simply providing food, but providing life skills, social connections and a place where people can just be for a while is something I really advocate for and subscribe to. Running into Mayor Watson on day 1 was pretty awesome, but so far, every time I’ve been able to close a constituent case I have derived an enormous amount of satisfaction in helping people. I wouldn’t be so naive as to believe I can solve any problems! I can certainly try very hard though. I’ve become very familiar with those issues mentioned above – snow, sidewalks, parking and trees – so I’m very happy to assist with problems relating to these issues. The more specific you are with your request, the more efficient we can be with helping you. We get a lot of requests or emails from people with no address, or asking for “support”. But specific details about what form you would like that support to take (show up at an event, tweet their cause, letter of support, etc.) always help us greatly, as we then know how to help you better. This is the first post in a series introducing you to the helpful staff who make up Jeff's Kitchissippi Ward office. These are the people who can help you with your day-to-day needs. Today, meet Hintonburg resident, and recent Australian transplant, Susan Ong.